This song won’t win any popularity contests, but this is a groove to jazz up your style. While many of the songs in this series have a notable mass appeal, this song is drawn from the annals of Jason Mraz’s live show repertoire. In my opinion, Jason’s best songs are not on his studio albums. There is an adventurous flavor to Jason’s B sides that never gets felt on his radio singles, and there is an energy and an inventiveness in his live show that I don’t think he has ever matched on his albums. This groove is a twisty blend of jazz rhythm and pop harmony with lyrics that perhaps would make more sense with the help of psychedelics. It’s an empty chuck 8th note groove that can start out puzzlingly simple and becomes unexpectedly difficult when you start to add the variations. As always, the live material of these artists give gems that the studio albums never can. The basic picking groove takes a little getting used to because the thumb slap comes immediately after a syncopated finger pluck. Still all 4 bars of this short loop are rhythmically identical so it doesn’t take long to get the idea. Singing over this groove can present a problem even for the experienced singing guitarist, and it takes a minute to realize it is because of how unexpectedly complex the vocal rhythms are. If you do the advanced version of this song, you have to try to mix the guitar variations an do the vocal improvisation in the bridges (yes multiple bridges). I can’t take the edge off of that one, so if you want to really play this song get ready to dig your heels in and explore unbeaten paths. One fussy note about the harmony in this song. I’ve written out what I perceive the progressions to be, but the chord voicings are jazz voicings that, in the most technical sense are ambiguous. Jason’s fundamental harmonic progression is a minor pop box, nothing original here. The twist is that the C and the G chord are voice quartally (in a series of 4ths). 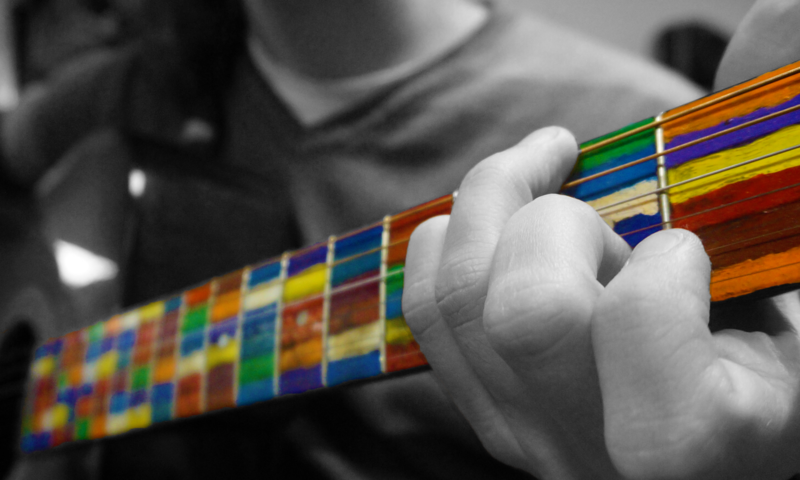 Quartal voicings on guitar will often include more color extensions than core triad tones. The quartal voicings Jason is using don’t have either of the guide tones (guide tones are the 3rd and 7th of the chord), so the quality of the chord is strictly ambiguous. Since there aren’t many notes that are outside the parent scale of this song, you just assume every missing note would be taken from inside the scale to fill out the chord. You can therefore assume that the chord quality would be the natural extension out of the scale. I point this out because I don’t want you to tell your friends that these chords are the chords that I have listed. If you take them out of context, you can’t really call them that. They are just a root with the 5th, 9ths and 13th extensions.